It's hard to put an adjective to madness when you're stuck in the Arctic Circle in almost near-nihilistic isolation. It's even worse when the only company you have under such circumstances is that of a colleague in the form of an imaginary demon. And when the nightmare leads you into inadvertent carelessness, and panic-stricken madness, your imagination tends to manifest it's own series of consequences, something that only intense isolation could create. And to make a movie that purposefully make you feel for the characters and think like them, it is essential that the viewer experiences at-least a fraction of that ennui and numbness of two men isolated at a meteorological station on an Arctic island. Aleksei Popogrebsky somehow doesn't delve into details, refraining from intricacies where the only details visible are as little as the specks of vegetation amidst a sea of rock, snow and ice. 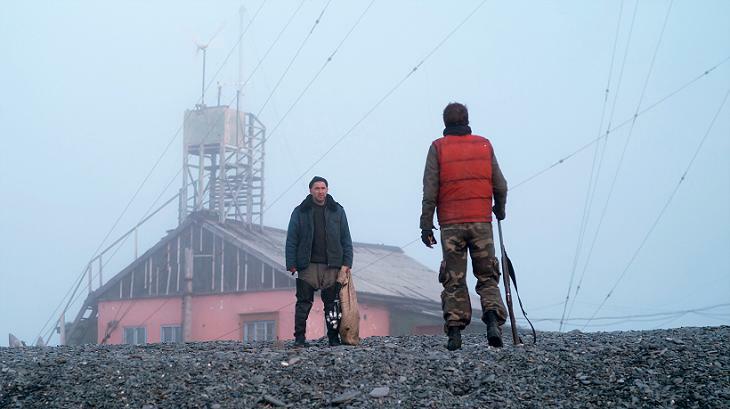 Pavel, a radiologist has been assigned for some seasonal work on at a polar station, where Sergei, a veteran at his job immediately sees the foolish, immature carelessness in the new recruit. Stuck with each other, this unlikely duo amble along days and weeks together, with nothing but curt, but polite conversation, mostly official stuff. Days and nights don't have visual cues in this environment. It's sunny all throughout, for six months of the year, and dark for another six. The men seem to be monitoring radioactivity on the island. What lies buried there and what they are meant to do should these readings spike is never disclosed. The only other "person" they correspond to is a curt, tingy voice, at the other end of a frequency wave. Sergei, being older and experienced, involves himself deeply in his hobby of catching and drying trout whenever he can, while Pavel, understandably bored out of his mind only has his secret stash of chocolates, video games and his mp3 player for company. Somehow for Pavel, these past-time activities turn into distractions at work, allowing him to screw up even the most simplest tasks. The movie's great puzzlement though is its dramatic raison d'etre, a decision Pavel makes seemingly without purpose or motivation. While Sergei goes fishing, somewhat foolishly leaving Pavel in charge, an urgent message comes through that Sergei's wife and child have been in a terrible accident. They may even be dead. But Pavel never tells Sergei about this message when he returns. Let's repeat this: Pavel never tells Sergei. Maybe it has something to do with Pavel oversleeping, missing a regular reading, then falsifying the logs. Or maybe Pavel is just scared of Sergei. Whatever the case, he soon has reason to be scared since one lie compounds another to keep the cover-up going. But where is the drama here? One character is terrified of his own shadow while the other is completely oblivious to the situation. When Sergei does learn the truth -- with the movie nearly two-thirds complete -- tension finally enters the scene as Pavel flees the station but knows he won't last long in that hostile environment without food, warmth or shelter. Maybe the whole film is an expose of video games and how they cause the young to view the world as one of hunter and prey.Dobrygin never is able to make sense of his nervous character, but Puskepalis' even-keeled performance could have anchored the drama were he not absent for long stretches. Pavel Kostomarov's cinematography is the movie's one triumph. He doesn't just capture the desolation and weird beauty of the frozen landscape, he makes it play visual tricks on the eye, like mirages in the desert, that fool you into thinking the place is a living, breathing menace. Visually and stylistically film is flawless. Cinematography with it's slow-pacing, static long shots and scenic wild nature shots is adorable. Atmosphere, when time seems ticking slower and cold wind awaits for you from another side of the door, is on the good level too. And as a native-speaker, I can say that dialogue-lines are also pretty decent. Polar station as a place is just a cause for examination of human communication (so-called "chemistry") in isolated space. Subject deals with responsibility, instinct of self-preservation, influence of isolated space to human psychics and importance of experience.